China is frantically giving finishing touches to world's largest radio telescope designed to find signs of alien life following NASA's recent discovery of 'Earth 2.0' with the planet-hunting Kepler space telescope. Technicians began to assemble the telescope's reflector, which is 500 metres in diameter and made up of 4,450 panels. Each panel is an equilateral triangle with a side length of 11 metres, state-run Xinhua news agency reported. Once completed, the single-aperture spherical telescope called "FAST" will be the world's largest, overtaking Puerto Rico's Arecibo Observatory, which is 300 metres in diameter. Nan Rendong, chief scientist of the FAST project with the National Astronomical Observatories, Chinese Academy of Sciences, told Xinhua that the bigger the dish is, the more capable the telescope is and the weaker messages it will receive. "A radio telescope is like a sensitive ear, listening to tell meaningful radio messages from white noise in the universe. It is like identifying the sound of cicadas in a thunderstorm," he said. The new telescope is expected to greatly enhance Chinese scientists' capacity to observe outer space. 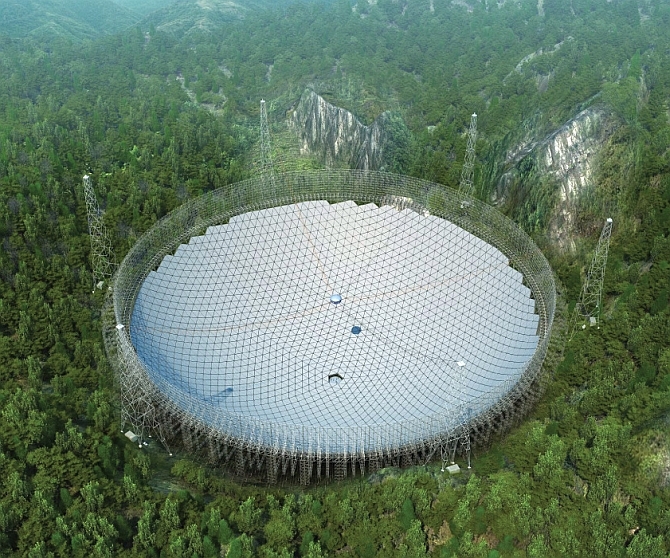 "There are three hills about 500 metres away from one another, creating a valley that is perfect to support the telescope," Sun Caihong, chief engineer of FAST's construction said explaining the reason why this site was chosen. The surrounding area has "radio silence" as there are no towns and cities within a sphere of five km and only one county centre within a sphere of 25 km, he said. The huge dish is actually hung over the ground supported by thousands of steel pillars and cables. There will be maintenance passages under it. The construction of the telescope began in March 2011 and is set to finish next year.